(March 28, 2017) Yesterday the Charlotte-Mecklenburg Planning Department made the PowerPoint Presentation from the March 14 wrap-up meeting for the Steele Creek Development Response Study available. 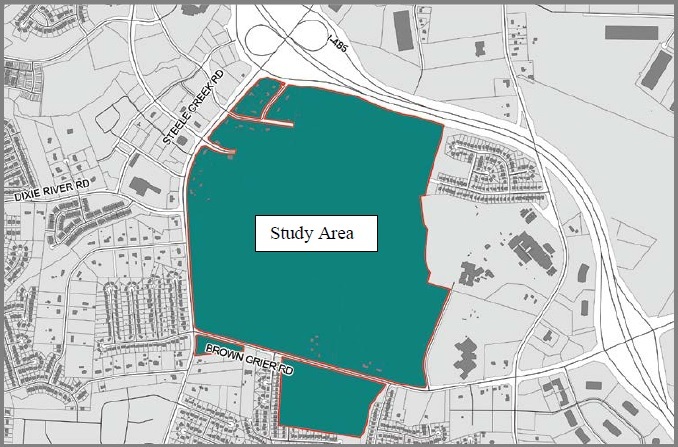 The study area is generally bounded by I-485 on the north, Steele Creek Road on the west, Brown-Grier Road on the south, and the creek along the west side of school property on the east. The area also includes areas south of Brown-Grier Road that are part of the Grier farm property. 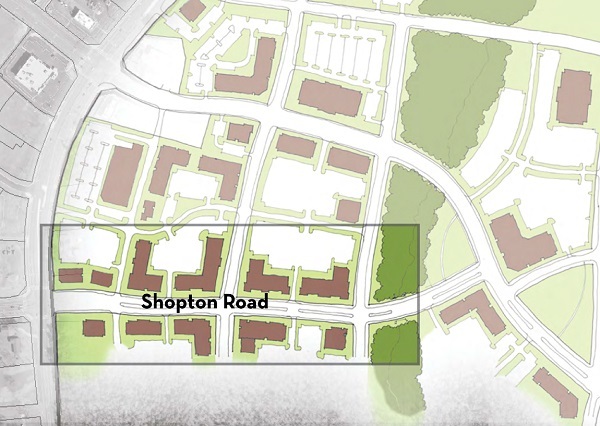 The Development Response Study relooks at the study area in light of changes and development proposals that have occurred since adoption on the Steele Creek Area Plan in 2012. It allows staff to look at different development scenarios and consider opportunities and impacts. The study does not represent official policy changes. It provides potential street and open space framework for future development, guidance on appropriate land use intensity, and enhanced guidance on community design. Development in Steele Creek is happening quickly and is different than the city expected five years ago when the area plan was adopted. The study area is one of the few large contiguous areas of undeveloped land left in Steele Creek. The whole area currently is zoned R-3 (up to three residential units per acre) except for the area along Steele Creek Road at Dixie River Road where the BP station, Bojangles, and dental office are located. That area is zoned for Neighborhood Services. 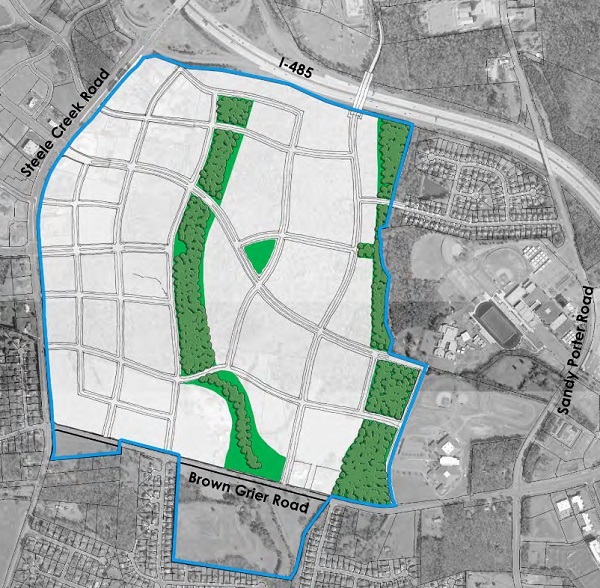 The Steele Creek Area Plan calls for residential development with up to six dwelling units per acre for the entire area north of Brown-Grier Road and residential development with up to four dwelling units per acre on the Grier farm property south of Brown-Grier Road. See Southwest District Adopted Future Land Use map. 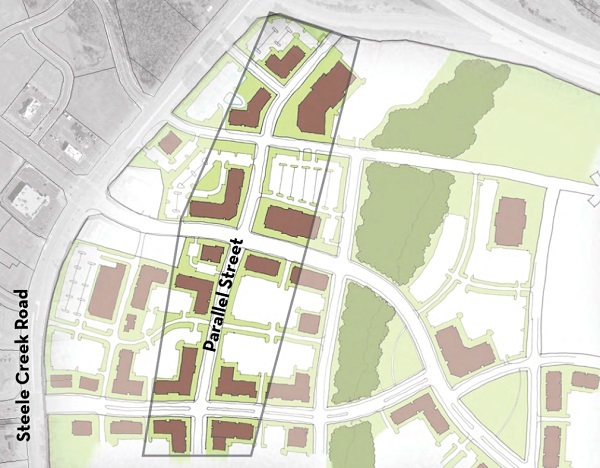 However, the Area Plan further states that "consideration will be given to a mixture of residential, office, and retail uses along Steele Creek Road. Retail development should be limited to a convenience size center (70,000 square feet maximum)." 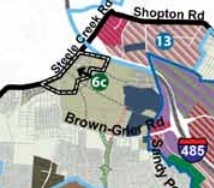 This is the area labeled "6c" on the map to the right from Page 13 of the Steele Creek Area Plan. A street network that promotes connectivity and includes extending Dixie River Road as a walkable, bikable route through the area to Sandy Porter Road. The road design would feature pedestrian refuges and be similar to the part of Dixie River Road west of Steele Creek Road that runs from the outlet mall. An open space network that is usable and connected. Concentrated development in the northwest quadrant of the study area that takes advantage of existing and future infrastructure. On the diagram below, the three shades of purple represent the transition of intensity from the northwest to the southeast. The level of intensity was not specified, just that the intensity would be less towards the southeast. A Main Street along the extension of Shopton Road West with businesses located along the street similar to Baxter Village in Fort Mill. A Retail Street parallel to Steele Creek Road. 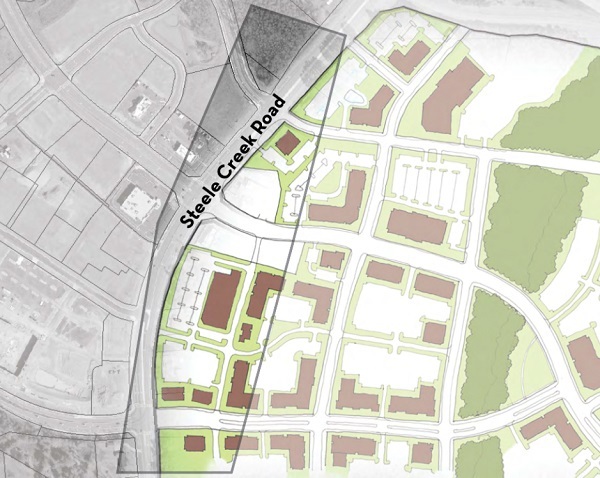 Development along Steele Creek Road that is consistent with that along a corridor with high vehicular traffic. Design standards that set the bar for high for quality and build from the character of adjacent development at the Berewick Town Center. What's next? There are three outstanding rezoning requests that likely will be revised to reflect the results of the Development Study. Two have had community meetings but will have additional meetings once the rezoning proposals are updated. Planning continues on improvements to Brown-Grier Road as part of the Comprehensive Neighborhood Improvement Program (CNIP) for the Whitehall/Ayrsley area. Additionally, the North Carolina Department of Transportation plans to widen Steele Creek Road beginning in 2022. See Community Input Requested for CNIP Road Projects and Steele Creek Projects Included in Latest Transportation Plan. Planning staff plan to release a draft report on the Development Response Study by April 17. A major obstacle is that the blocks created by the proposed grid of streets are inconsistent with the property lines for the separate parcels in the stud area. There will need to be cooperation among the property owners and possible exchange of land. Neighborhood For Sale: The Clearview Acres neighborhood with about thirteen residences north of the BP station is currently for sale as a unit. Whoever purchases this area likely submit a petition for a commercial or mixed use development. 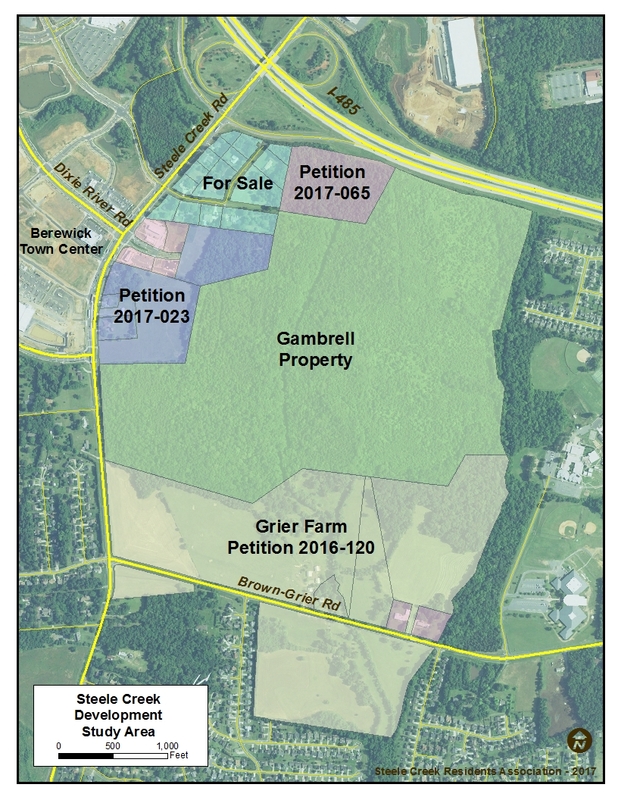 Grier Farm: Pulte Home Corporation has submitted Petition 2016-120 for the Grier Farm along both sides of Brown-Grier Road. 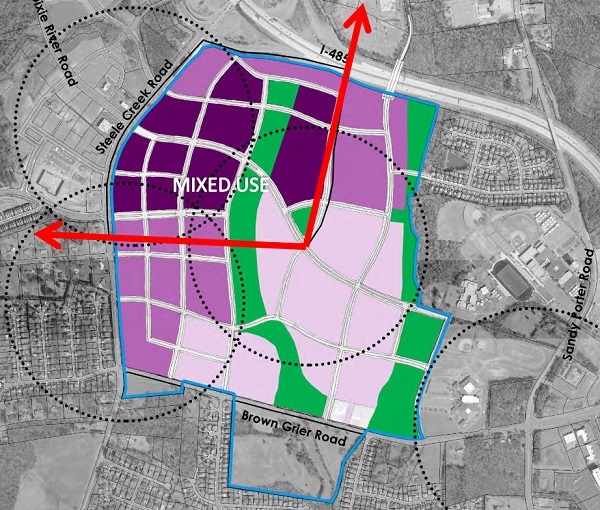 The submitted site plan calls for 292 apartments, 550 townhomes, and an 80,000 square foot shopping center on 127 acres. This plan is currently under revision and is likely to become less intense. 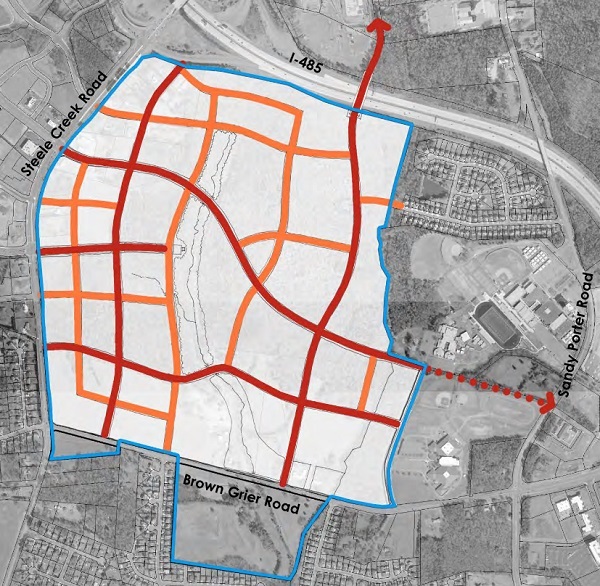 Some areas, including the parts south of Brown-Grier Road, may be removed from the current petition. Petition 2017-065: This petition is not yet available online. The petitioner is requesting rezoning to allow construction of apartments.